EVERAL WEEKS AGO, following the terrorist attacks in Paris, people began various efforts to show solidarity with the victims and with the French people. Americans were in a unique position to sympathize, having experienced for ourselves the devastating effects of terrorism in our country. One such display took place at the Lits Building here in Philadelphia. A classic example of Renaissance revival architecture, the building first housed the Lit Brothers department store in 1891. It has changed hands over time, but the façade of the building remains essentially unchanged (and quite beautiful). 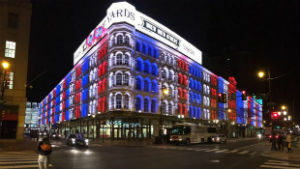 To support the people of Paris, the building was lit up in blue, white, and red. Similar displays occurred on landmarks throughout the world, including the Eiffel Tower, Jerusalem’s Old City walls, the Tokyo Skytree, London Bridge, the Cristo Redentor statue in Brazil, and at least 30 or so other places. Even many Facebook profile pictures were tinted blue, white, and red. These displays were, in my estimation, a good idea—gestures of affirmation and compassion in the wake of a terrible tragedy. UITE DIFFERENT was the light show displayed recently on the façade of St. Peter’s Basilica. I agree with the position of my fellow blogger, Andrew Leung, that this was a wholly inappropriate usage of a sacred space. What harm does something like this do, one might ask? First, it helps to erode our corporate understanding of the distinction between sacred and secular. This is not an insignificant point in an age that is so given to secularism. Secondly, while it is true that nothing we do can “hurt” God, it is equally true that we are very capable of offending God. If anyone doubts this, simply recite the Act of Contrition or read the passage about Jesus clearing out the Temple (Matthew 21:12-17). If the cleansing of the Temple is too familiar or seems too cliché, then read Daniel, chapter 5 to see how the Lord reacted to the way King Belshazzar used the gold & silver that his father, Nebuchadnezzar, had looted from the Temple in Jerusalem (Cliff’s notes version = it resulted in the unceremonious fall of his kingdom). The Bible is quite clear that the reservation of sacred things for that which is sacred is a serious matter. It is worth mentioning that the recent light show at the Vatican is not the first occasion on which a church building has been misused. 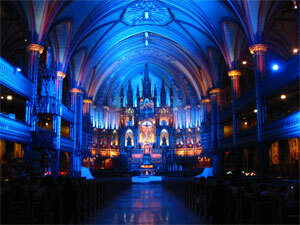 Far more egregious than the display on St. Peter’s was the light & sound show that was staged for many years inside the Notre-Dame Basilica in Montréal, one of the most stunning church buildings I have ever seen. The light display was called “And Then There Was Light.” The performances there ceased in August 2014, but apparently only because the creators are working on a new version of the show. I love lights and I love theater. In fact, I ran spotlight and light boards for two years in high school as a member of the stage crew, before I decided to join the cast for the next two years. The difference is that our high school shows were in an auditorium designed for performances. None of this type of thing—no matter how well intentioned—belongs in a church building. T ISSUE HERE is a fundamental misunderstanding of what a church building is. Church buildings, for Catholics, are never merely meetinghouses; they are not simply bricks & mortar; they are not lecture halls or concert halls or fellowship halls. A fuller treatment of the nature & purpose of church buildings can be seen here. A Catholic church building is always an image of the living Body of Christ. Catholic churches exist as places wherein the sacrifice of Christ may be renewed. They ought not to be treated as houses of entertainment, but as houses of prayer. They ought not to be treated as projection screens, but as places where the veil between heaven & earth is drawn back. Lighting up the Lits Building to show solidarity with France was a good thing. Showing a movie on St. Peter’s Basilica was not.